This is a companion product to BLACKFIRE Polish designed to remove deeper swirls, scratches and defects in ceramic particle and scratch-resistant clear coats. This is the same abrasive technology used at the OEM level by German and domestic automakers. Use BLACKFIRE Compound on paint flaws that cannot be removed with BLACKFIRE Polish. 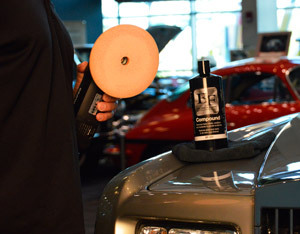 For the best results, apply BLACKFIRE Compound with a dual action polisher using a CCS Orange Light Cutting Pad. These orange pads are used at the OEM level on ceramic particle and scratch-resistant clear coats. BLACKFIRE Compound is designed to remove imperfections from the paint without dulling the surface or creating compounding haze. After compounding, use BLACKFIRE Polish with a clean polishing pad to further enhance surface gloss. Hand application - Apply with a dense foam applicator or microfiber applicator. Mist clean pad with pad conditioner. Apply a nickel-sized amount of Compound onto applicator. Work on a 2 x 2 sq. ft. area. Wipe compound over paint using short, firm strokes until polish starts to turn clear. Wipe off immediately using a microfiber towel. Machine application - Wok on a 2 x 2 sq. ft. area. Mist a clean foam cutting pad with pad conditioner. Apply an X of compound onto the pad. Spread the compound over one section with the machine turned off. Set the speed at 5-6 on a dual action polisher or 1,200 - 1,500 RPM on a rotary polisher. Work the compound over the surface using moderate pressure until it begins to turn clear. Buff of compound by hand using a microfiber towel. Related Items - BLACKFIRE Compound 128 oz.